Thinking about some DIY skin care gifts this holiday season? Salt and sugar scrubs can be deliciously easy; most ingredients you may already have around the house, with no unpleasant preservatives/chemicals/mysterious “fragrances” found in many store bought products. But there’s a little more you should know. 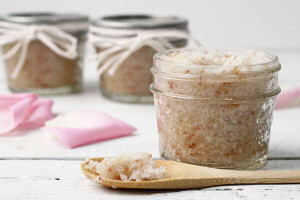 When making a salt scrub make sure to use sea salt, not regular table salt. Sea salt helps draw toxins from your body and can act as an anti-inflammatory agent if you suffer from sore muscles. Because the edges of sea salt granules are relatively sharp, the scrubs should be reserved for the less sensitive areas of your body; such as elbows, heels, legs, etc. Stay away from any sensitive areas with a salt scrub and avoid using it altogether if you have any skin abrasions or very sensitive skin. Sugar scrubs can be made with table sugar as well as with unrefined sugar or brown sugar. Table sugar granules are rounder than those of sea salt which makes them better for use on the face as well as other sensitive areas on your body. It makes a great mild scrub since it dissolves rather quickly in water and it leaves your skin feeling super soft. Unrefined cane sugar is slightly more abrasive than table sugar, but it’s still not as irritating to your skin as a salt scrub can be – It can be used all over your body to keep it soft and smooth, but you should avoid using it on your face (especially if you have sensitive skin). Brown sugar has the added benefit of smelling heavenly, and the scent will linger on the skin, delicious! A basic recipe will call for an oil (such as olive, coconut, or grape seed) and and exfoliant (salt or sugar), and a few drops of an essential oil for fragrance and aromatherapy properties. Mix in a small mason jar, tie on a cute wooden scoop with a festive ribbon and viola! Looking for someone else to do the work for you? Schedule an appointment with us today. We’d be happy to share more tips for DIY skincare tailored for you. You can also request a custom skin care product from our own Privy Skin Care line.